Q. Which Yoko piece(s) are you responding to and how? A. I am taking Yoko Ono’s current day Twitter feed as an unrequited instruction set. 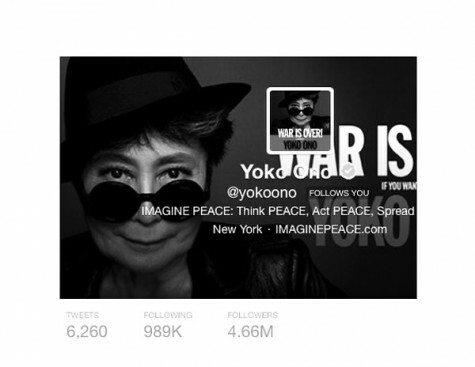 I follow Yoko Ono and Yoko Ono follows me. Q. If we imagine a spectrum in which predetermined structures, scores, instructions sit at one end and spontaneity, intuition, improvisation at the other – where does your work sit in that spectrum? Or is that spectrum faulty to begin with? A. I have a structure within the walls of the MCA. The technology of the image projection. The design of the seats. We have voice, light, human will. I feel energised by unbridled human energy in tightly controlled environments. Postscript. I don’t believe in freedom in art. It can only be given by imposing a structure or rule set upon it. There is no freedom. There is no restraint.